In Iraq, ISIS Attacks City Of Kirkuk As Battle For Mosul Rages : The Two-Way Militants struck police stations and a power station in the northern city. In Mosul, the U.N. says it is concerned ISIS may be using civilians as human shields as Iraqi forces advance. Iraqi army soldiers raise their weapons Thursday in celebration on the outskirts of Mosul, Iraq. ISIS fighters launched attacks on police Friday in the city of Kirkuk, as Iraqi security forces continued a massive military offensive to try to pry Mosul, one of Iraq's largest cities, from the militant group. "The fighters struck [Kirkuk] before dawn, with suicide bombers hitting four police stations and gunmen killing police," NPR's Alice Fordham reports from Irbil, Iraq, though the number of casualties wasn't immediately clear. "A curfew is imposed in Kirkuk, but eyewitnesses say fighting continues." The militants also hit an electricity station outside the city, Alice says. At least 13 workers died in the apparent suicide bombing, according to The Associated Press. Multiple news reports said the Islamic State group claimed responsibility for the attacks in statements online. The Kirkuk attack drew focus away from the multi-pronged Iraqi offensive on Mosul, now in its fourth day. It's billed as the toughest fight yet for security forces battling Islamic State militants. Victory there would push ISIS out of the last major urban center under their control in Iraq; the group has held Mosul since 2014. 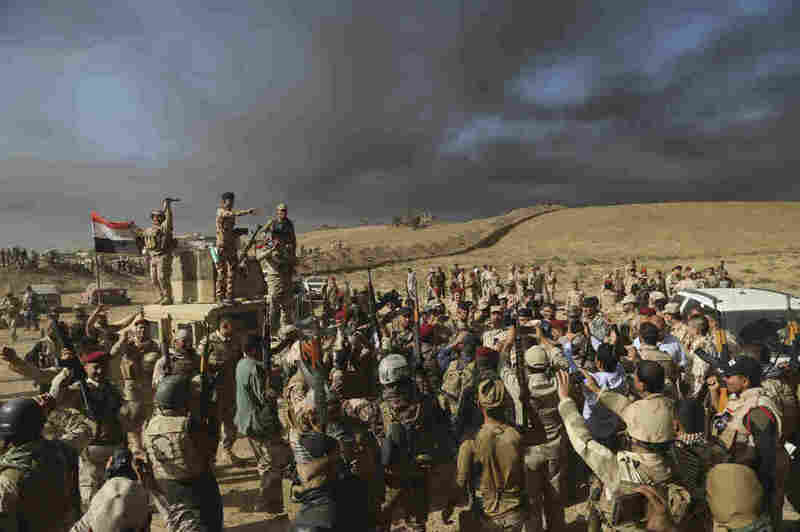 Iraqi forces on the ground were reporting progress, and "officials said they had advanced as far as the town of Bartella, 15 kilometers (9 miles) from Mosul's outskirts, by Thursday," the AP reports. However, the U.N. says reports are emerging that the Islamic State fighters may be using civilians as human shields. As Iraqi forces advance toward Mosul, U.N. High Commissioner for Human Rights Zeid Ra'ad Al Hussein says, reports indicate that ISIS is "keeping civilians close to their offices or places where fighters are located, resulting in civilian casualties." The U.N. Human Rights Office says that on the first day of the offensive, according to these reports: "ISIL forced some 200 families out of Samalia village to walk to Mosul," and "350 families fled Bajafia village in Nimroud Sub-district, towards Mosul, highlighting ISIL's apparently policy of preventing civilians from escaping to areas controlled by Iraqi security forces." The U.N. office also has gotten reports that "at least 20 civilians were shot dead by ISIL in one of the villages outside Mosul." Al Hussein added that "we know ISIL has no regard for human life, which is why it is incumbent upon the Iraqi government to do its utmost to protect civilians." U.S. troops are assisting Iraqi forces as on-the-ground advisers and by providing air support, but they are not taking part in ground combat. The Pentagon said Thursday that a U.S. service member was killed in northern Iraq. It has now identified the deceased individual as Navy Chief Petty Officer Jason Finan, 34, a bomb disposal technician from Anaheim, Calif. He died from "wounds sustained in an improvised explosive device blast."